TSDuck is a toolkit which manipulates MPEG Transport Streams (TS). As a product, TSDuck provides many different command-line tools and plugins. Internally, the architecture of TSDuck is made of a large shareable library (tsduck.dll on Windows, tsduck.so on Linux and macOS). Most of the valuable processing is performed by the various C++ classes from the TSDuck library. All command-line tools and plugins are usually small wrappers around this library. 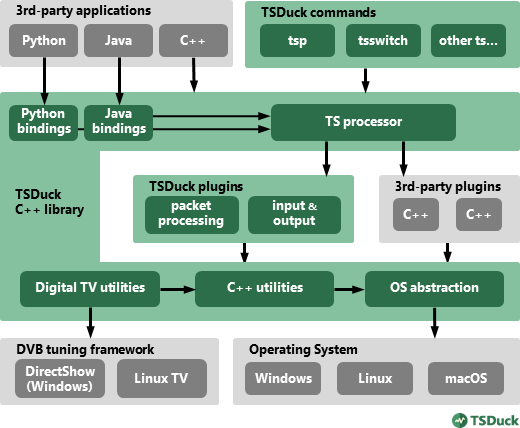 The TSDuck library offers generic C++ classes for operating systems features as well as specialized classes for MPEG/DVB transport streams. This library can be used as a general-purpose C++ library for third-party applications, outside the TSDuck tools and plugins. The diagram below illustrates the TSDuck software architecture. This set of documentation is a reference for the TSDuck library. It can be used either by TSDuck maintainers and developers of third-party applications.